Dr. Vicki Wynn grew up in Oklahoma surrounded by many different types of animals. She accompanied her father, a bull fighter (rodeo clown) and showman, on his rodeo circuit during her childhood. Dr. Wynn was exposed to various companion animals, farm animals, and wildlife and knew she would always be involved with animals. Her love of science led her to pursue a career in veterinary medicine. 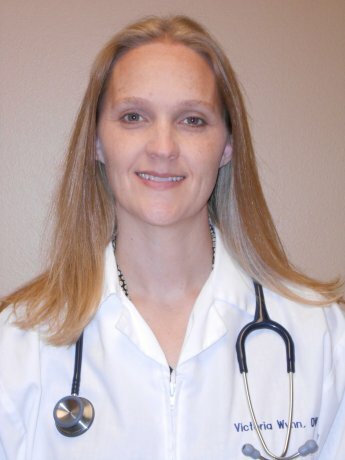 Dr. Wynn completed her Bachelor of Animal Science and her Doctorate of Veterinary Medicine at Oklahoma State University. During her studies, Dr. Wynn completed a National Institutes of Health research project exploring laser ablation of urinary stones. This published research helped pave the way to the clinical use of lasers in the treatment of uroliths. After graduation, she entered into private practice in Oklahoma City. A year later, Dr. Wynn was asked to return to OSU and teach the senior students in their clinical medicine rotation. While Dr. Wynn enjoyed teaching very much, she missed the deep and lasting relationships with clients and their pets that is possible in private practice. She and her family moved to Colorado Springs in 2005 where she has been practicing ever since. Dr. Wynn is excited to offer her services at Timberview Animal Hospital and looks forward to growing her extended family of animals and their owners. She is involved in numerous organizations and has been a board member of the Colorado Springs Area Veterinary Society for several years. Outside of veterinary practice, Dr. Wynn loves spending time with her husband Trey, their two boys Dylan and Aaron, and their dog Jack. The family enjoys all Colorado has to offer and try to hike, camp, and fish as much as they can. More staff member info to come!